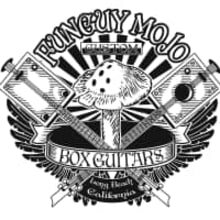 Here at Funguy Mojo Guitars, we are dedicated to bringing the very finest, solid, stage worthy versions of these historical American Blues/Folk/Roots instruments while keeping true to the time honored tradition of making sure each instrument is hand assembled from an assortment of repurposed, household items mixed with the highest quality modern string instrument parts available. We bring these historical instruments from the porch to the stage! In addition to our own products we also offer a variety of other hand picked unusual instruments from around the world.